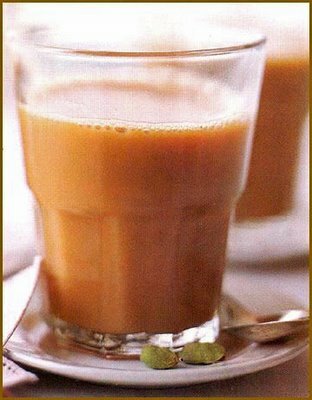 A recipe for Chai from Rushina Munshaw Ghildiyal's soon to be released food memoir on Mumbai "My Mumbai Cookbook"
We usually make a batch of chai masala and store it in an airtight jar to last a couple of months. It makes brewing that cup of tea whenever required, that much faster, convenient on rainy days, when the craving strikes more often. This mix is good for relieving the aches and pains of colds, coughs, flu and fevers. Dry all the ingredients in the sun or in a low temp oven for 2 hours to ensure no moisture is left. Grind each spice individually in a dry grinder or coffee grinder. Strain out larger pieces with a fine sieve and grind again. Combine all the powdered spices and mix well. Transfer to an airtight jar to store. On days when life gets a little difficult to handle and I want a c of comfort, I go back to the way masalla chai was made in my mother's house, reliving each time that special day when my mother taught me how to make tea. Combine water and milk in a saucepan deep enough to prevent boiling over. Add, lemongrass, mint, sugar, chai masala cardamom and ginger and bring to a boil. Lower the flame, and add tea leaves. Be careful, because when the tea leaves go in the concoction tends to rise and can overflow. Raise flame and allow to boil. When tea boils, it will begin to rise, lower flame and it will settle. Raise flame and allow to rise, the lower and leave on simmer. When the tea rises again, take saucepan off the flame, once it settles return to flame. When it rises again, switch of flame, strain into cups and serve.